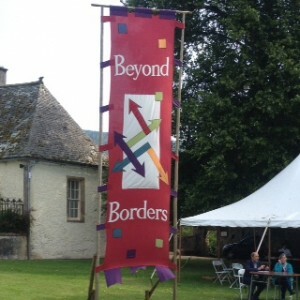 This weekend we took the Edinburgh Larder experience to the Beyond Borders Festival at Traquair House near Peebles. It was a great experience to run our café from a tent and with no idea how many people would come our way we were kept on our toes from start to finish. Our fabulous catering chef prepared a delicious selection of internationally inspired foods using local and foraged ingredients. These went down an absolute treat with people raving about the delicious soups and tempting cakes. Fiona the forager brought along some fresh wild mint which we served as a tea so thank you Fiona for the kind contribution. There was a great buzz as Nicola Sturgeon arrived to give her talk and much discussion about it afterwards. It was great to be part of the event and to be in such gorgeous surroundings so thank you to the organisers for choosing us to cater for a great weekend.